The only thing worse than running out of clean clothes is realizing you’re also out of detergent when it comes time to clean them. 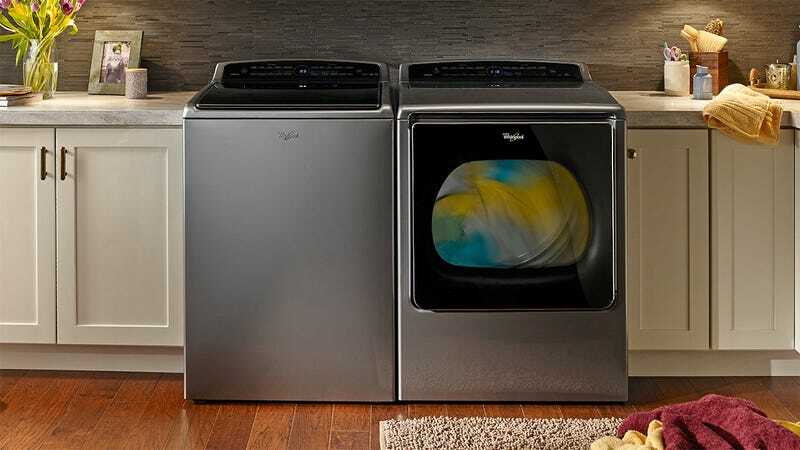 So Whirlpool is introducing a new washing machine and dryer with Amazon Dash’s replacement service built right in ensuring you’ll always have enough soap or fabric softener on hand. The Whirlpool Smart Top Load Washer and Dryer both connect to the Whirlpool mobile app running on an iOS or Android-powered device allowing users to remotely start either appliance, adjust the wash or dry cycles while away from home (or when too lazy to wander back downstairs), turn on a quiet mode when kids are sleeping, and get notifications for when a load is done. But those features are old-hat by now. What makes these new appliances interesting is that Whirlpool has upgraded its mobile app with Amazon Dash Replenishment integration. Instead of having to press a button when it’s time to buy more detergent or dryer sheets, it’s even easier now. The washer, dryer, and app automatically keep tabs on when you last stocked up, and how many loads you’ve done since then, to estimate when it’s time to place another order. Whirlpool’s new Smart Top Load Washer and Dryer should be available very soon and each will set you back $1,400. So they’re definitely on the pricier side as far as appliances go, but it might be worth it if it means never again having to dash to the store for detergent while you’re in the middle of doing laundry.